SmartPractice provides dental offices with an eco friendly alternative to standard toothbrushes from WooBamboo. WooBamboo Toothbrushes give dental offices the opportunity to offer more than a clean mouth, but also a clean conscience. WooBamboo Toothbrushes give dental offices the opportunity to offer “more than a clean mouth,” but also “a clean conscience,” claims the brand’s Co-Founder, Christopher Fous. With a motto of "Innovate. Inspire. Change the world. ", the company's mission is to empower consumers to make small changes toward a more eco-friendly lifestyle, infusing this philosophy in practical, daily routines like brushing one's teeth. WooBamboo Toothbrushes provide a quality clean with biodegradable, organically grown and antimicrobial bamboo. They are also designed with esthetics in mind, complementing bathroom décor. Toothbrushes are available for adults, children and pets, with bristle and handle options to match each demographic. Also, the bamboo used for WooBamboo toothbrushes does not deplete pandas’ food sources and grows up to four feet per day in the correct conditions, making it an abundant and sustainable material for toothbrushes. 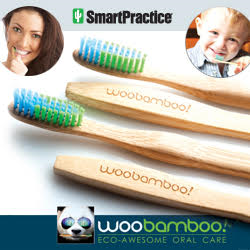 SmartPractice will provide the option for dental offices to personalize their WooBamboo Toothbrushes with their name and contact information in 2016. To learn more, please visit smartpractice.com/toothbrushes or call 800.522.0800. Customers may call to request a sample at no charge.